I've been having a lot of fun posting pictures lately. It's been first graders for a while, and now it's back to dogs! We went to a park in Santa Rosa over the weekend, and of course had to wear tie-dye and take pictures. Here is Moxie again, in his green and yellow dog shirt. It's always hard getting a good picture of a very black dog, but he looks good in the sun. Cruella is a Hairless Chinese Crested Dog belonging to some friends of my mom. Cruella doesn't have any fur other than the bits on her head, ears, legs, and tail, so she gets cold easily, even during the summer. She is used to wearing shirts and sweaters and jackets almost all the time. I had passed along a tie-dyed dog shirt through my mom, even though I had never met Cruella. A bunch of my mom's friends gather at the park regularly, and it just happened that Cruella happened to come wearing the tie-dye shirt this time. What luck! I finally got to meet Cruella and she's dressed for the occasion! Cruella is quite the model, isn't she? She's wearing a size Small shirt. Cruella and Moxie look fabulous together. 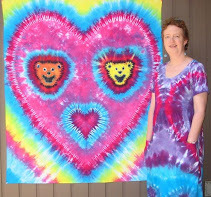 Why Do People Keep Calling Us "The Tie-Dye Family"? Well, I suppose it's better than "The Polka-Dot Family"! As a family, we often wear our brightest, loudest tie-dye clothes when we go out in big public places such as Disney World. It's purely practical--it makes it much easier to keep track of our group ("Are you missing a little girl in tie-dye? She went thataway."). My mom and my father-in-law aren't into the tie-dye thing, but they were good sports for our park outing. I suppose you could consider my mom's shirt shibori rather than strictly tie-dye, but it's close enough. Finally, a good family picture! Wow, you are a great-looking bunch! I've always wanted to see how a Chinese Crested Hairless would look in a tie-dyed doggie shirt. Cruella looks fabulous! Thanks for posting your wonderful pictures. What Do You Mean, "Soak It"?